There is nothing quite like satin sheets on your bed. The soft silky feeling that provides a cool surface during warm nights. The surface is much smoother than cotton sheets and makes you feel like you are lying in luxury. Satin sheets are different from silk sheets. 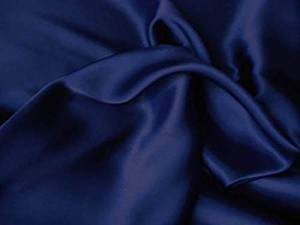 Satin sheets have to have a shine, and it can be made of any material, but in a strict sense must be made of silk. But because satin can also be made from polyester or nylon, it is best known as a weave. Read our latest guide about the best bamboo bed sheets. The top side is shiny and smooth, but if it isn’t made of silk, then the bottom side isn’t as smooth as the top. The traditional kind of silk satin sheets is on the more expensive side. But whichever fabric you choose a nylon satin sheet can offer similar luxury as a silk satin sheet, and you won’t feel the difference while you are lying on it. Read our complete guide about the best bed sheets. How to care for satin sheets? The threads in a silk sheet are flat, and your body can glide above it easily. They are comfortable and smooth considering they are the peak of luxury. Satin sheets can be made from other materials except for silk, but they are smooth and shiny as well, with a sleek surface. Silk is fragile but durable if it is cared for properly. If maintained well, it will last long without losing color. But if not maintained they will become thinner with use. Satin sheets are very durable, more than silk because of how they are woven. The intricate weaving makes it harder to tear. Silk sheets have to be washed by hand in cold water, then dried in a warm place. One shouldn’t wash silk sheets in a machine or use the dryer for drying it out. Satin sheets, if made out of bamboo or silk need the same care. However, most satin sheets are made of nylon or polyester, and you can wash them in a washing machine. Satin can be made of different types of fibers, and it is essential to understand them first before you decide on the care. Based on the material used you can either hand wash or use the washing machine. But if the sheet is made of other materials, then you can use the washing machine, set to gentle wash. Always use a gentle detergent and cold water. Don’t use hot water or very harsh detergents as they will affect the texture of the sheet. Do not tumble dry in high heat. Just hang on a line to dry to air dry it. It is best if it is dried away from direct heat and light as it will make the fibers weak and affect the colors. If you need to iron, it uses a pressing cloth between the sheet and the iron. Use the wrong side or bottom side of the fabric to iron it out. You must have heard many times that one must use silk pillowcases to sleep. It is gentle on your skin and hair. It prevents wrinkles and hair breakage. Similarly, satin sheets have pros that are beneficial and lead to their purchase. Satin sheets feel and look smooth and glossy. Even though it may not be silk, it is smooth and doesn’t cause a rip easily. 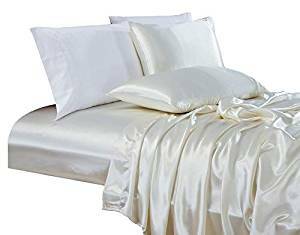 Satin sheets have this amazing health and hygiene benefit that you cannot get with cotton sheets. The fabric is inhospitable to dust mites, and hence you get a clean bed. Satin sheet and pillowcases are the reason for gorgeous silky hair. Instead of looking for a hair care product choose a sleek satin sheet and pillows to minimize hair breakage and matting. Cotton will cause more friction leading to matting and breakage. It also absorbs moisture from your hair making it dry and frazzled. Satin doesn’t absorb moisture and will leave your hair glossy and shiny. If you have blow dried your hair then it will last longer if you sleep on satin. It will allow the hair to slip around without getting entangled. 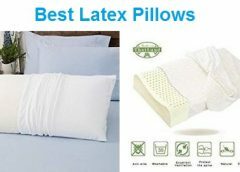 People who are bedridden are advised to used satin pillowcases and sheets as that way the hair doesn’t get rubbed in a harsh way, preventing hair loss. If you have dry and itchy skin that is very sensitive, try sleeping on satin sheets. These sheets glide over your body easily and will not irritate skin. Satin sheets are soft and cool, making it very comfortable to sleep on. Satin sheets warm well on cold nights making it a perfect sleeping surface during all seasons. Sleeping on a cotton bedsheet or pillowcase can lead to lines on your skin. These go away soon enough, but over time it may lead to fine lines and wrinkles. Cotton doesn’t allow the skin to slide smoothly and so chances of lines are higher. Cotton sheets also take away moisture from your skin resulting in dry, brittle skin. Using satin sheets and pillowcases reduces the chances of lines and dry skin. Satin sheets have amino acids which make your skin look younger. They also repel dust mites and are very good for people prone to allergies. Satin sheets give you a feeling of luxury while you sleep on it and you may be a first-time buyer or a veteran. So, what do you actually look for before you buy satin sheets? See below the fine points of choosing the right kind of bedsheet for you. Satin sheets are available in normal sizes, but you must be careful while ordering for a king size bed – California or Eastern. Measure your bed, the depth of your mattress and add some inches to it as the sheets need to be tucked in. A woven satin cloth is only 45 inches long, and twin sheets for large beds may be having seams. Look for seams down the middle of the sheet, so that no one sleeps on the seam. Choose your colors wisely. 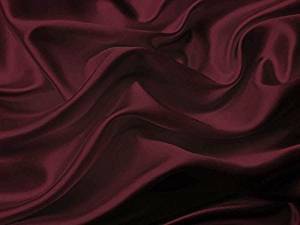 Dark colors are offered on satin sheets, but the colors may bleed or stain, depending on what color you buy. Sheets with prints can hide stains or marks and may allow you to use those sheets longer. 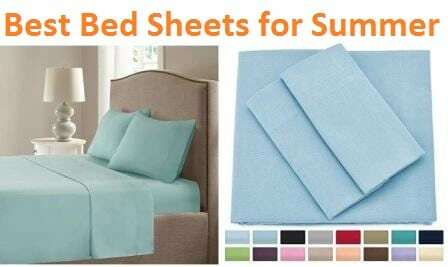 Try buying fitted sheets as they are much easier to have and keep on the bed. Other types will slip off, and it will be difficult to keep them on the bed. Satin sheets don’t stretch much so buy the size accordingly. Satin sheets made of nylon or silk have to be shielded from the sun. If you have a sunny room, then you can go for polyester satin or acetate. Consider the washing instructions when you buy the satin sheets. Different materials need to be handled in different ways and sometimes may involve dry cleaning which is expensive. Bedding Emporium makes bedsheets, duvet sets, comforters, bed skirts, waterbed sheets and reversible duvet sets. You can redefine the way you furnish and decorate your room with Bedding Emporium. They have bed sheets and covers in black, burgundy, aqua blue, chocolate, grey, gold and a whole range of colors. The sheets are sewn and made up of three panels to fit a large bed. They offer flat sheets, fitted sheets and duvet sets in various sizes like a twin, full, short queen, twin xl, full XL etc. 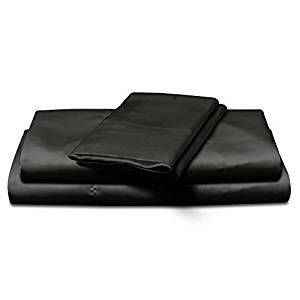 The Bedding Emporium 100% Pure Silk Satin Sheet Set has 7 pieces – 1 fitted sheet, 1 flat sheet, 1 duvet cover and 4 pillowcases in a gorgeous black color. The fitted sheet has an elastic edge that can accommodate a mattress with a depth of 15 inches. The silk satin sheets will give you the ultimate sleeping experience and be gentle on your skin and hair. The sheets and duvet cover are made for a king size bed with a 15-inch-deep mattress. The fitted sheet has a secure elastic edge that grips the mattress and keeps the sheet in place. The pillowcases have dimensions of 20×40 inches. The set is made of premium quality silk sheets, duvet and pillowcases. It is made from the highest quality of satin silk. The material is soft and breathable that allows one to glide over the surface. It is gentle with moisture-wicking properties that leave you with soft skin. The satin sheet adjusts itself to the body temperature to keep one cool in summer and warm in winter. It will not absorb moisture from the skin to prevent lines. It protects and hydrates hair and skin. One can sleep comfortably on it, especially if you have sensitive skin. These sheets prevent itching and are gentle on your skin while you sleep. Comfortable and soft while being gentle on skin. Light, cool and breathable for a great sleeping experience. Great color with the sheen. Concerns of the sheet having manufacturing defects with wrinkled ends. This item is not being considered as very luxurious, but below average by some customers. Fed up of trying different cotton sheets for your bed yet not getting a perfect one? This happens most of the time when the bed sheets are purchased online. They either lose their colors in the first wash or get shrunk. But with Pizuna Linens, you can shop without any tension. With superior quality, breathable material and utmost comfort, Pizuna is here with a wide range of luxurious satin bed sheets suitable to your bed. 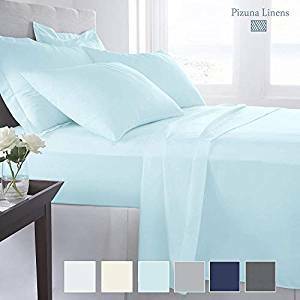 No matter whatever is the size of your bed, Pizuna high count cotton satin sheets comes with high-quality material along with complete elastic fitting. 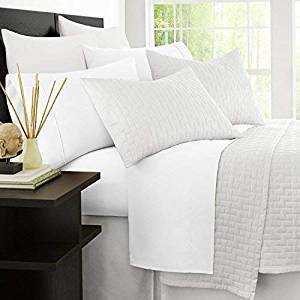 The linen sheets are available in different sizes to fit your bed like Full 4pc sheet set, Queen 4pc sheet set, Queen pillow pair, 6pc Queen sheet set, King 4pc sheet set, King pillow pair, 6pc King sheet set, California King set, California King 4pc sheet set, and Split King 5pc sheet set to select from. Not only the sizes but you also a wide range of colors that include white, ivory, light blue, silver, dark blue and dark grey. Pizuna brings you bed sheets in superior quality that are authenticated with 1000 thread count. With a combination of cotton and linen, these sensitive skin sheets are well tailored with perfect measurements. The bed sheets are made with a chemical-free process and Fade Resistant Dyes that remains bright even after several washes. Perfect breathable combination of cotton and satin, OEKO-TEX standardized material, smooth and durable… What else do you require for having a sound sleep at night? Use it in summers or during winters; it provides with perfect temperature balancing to keep you sweat free and warm easing quick and healthy sleep. Love the soft bed sheets at hotels? Why not get one for your own bed? Yes, the 300-thread count silk soft bed sheets by Rayon is here to give you that luxurious feel. The bed sheet comes with a convenient design that is much comfortable for the people having any kind of chemical sensitivity or allergies. The bed is designed with bamboo-derived material that helps in regulating the body temperature of the user and also prevents from overheating. With bedsheet dimensions like 90×90 inches and pillow dimensions of 20×26 inches, the bedsheet is available for twin size bed, Queen size bed as well as King size bed too. The bed sheet is also given a zipper closure in the inner side which keeps the sheet firm on the bed holding the duvet, blanket or even the quilt properly. Again, the envelop closing design of the pillowcases make it easy to use them. Along with the sizes, Rayon brings a wide range of elegant colors too for your room like grape, ivory, linen, mocha, navy, pink, silver, turquoise, and even white. Rayon Bed Sheets derived from Bamboo and cotton which makes the bed sheet breathable and quite moisture whacking too. The quality of the bed sheet is also known as Bamboo quinone as it is prepared with anti-bacterial, anti-mite, and insect as well as deodorant proof properties which is much helpful for the people with sensitive skin. The green material of the bedsheet is much soft and cool which makes it the best for small babies too. The Rayon bed sheets are much helpful for improving the health quality which helps in improving the sleep. Made from bamboo fiber, the bedsheet comes with extra softness and smoothness that provides with a comfortable sleep. If you are looking for next level sleeping comfort, microfiber is the latest favorite in the linen world. Danjor linens bring you these distinctive uniquely thin bed sheets made up of natural hypoallergenic microfiber. 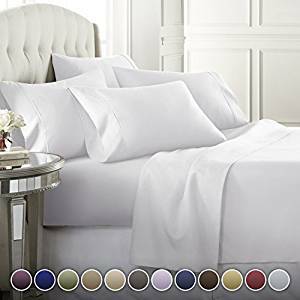 Beside looking luxurious, the premium bed sheet set guarantees durability and extra strength and has other properties such as wrinkle resistance, easy cleaning, and, stain resistance. These satin sheets are available in almost 10 different colors to go with a different type of interior design style. The bonus pillowcase can be a lovely collection to your complete bedding set. Rest away to the night with a good night sleep on allergen-free bed sheets. This luxury set of satin bed sheets are fully elasticized to fit any twin, king, full and queen size bed. The sheets can fit up to sixteen inches deep pockets and fit all the modern day mattresses. The six pc set includes 1 72″x84″ fitted sheet, 1 108″x102″flat sheet, and 4 20″x40″ pillowcase. The manufacturing brand also provides 100% satisfaction and return on your product if you are unsatisfied with the quality of your sheets. Throw away all the cheap imitations and get yourself these hypoallergenic, fade resistant bedding set. Danjor linens premium quality bed sheets are made up of the highest quality 100% double brush microfiber fabric. That means optimal softness making it one of the top-selling bedding sets. For the thread count, the brand does state the gsm count for the microfiber, but it has more heavy feel like a fluffy flannel. 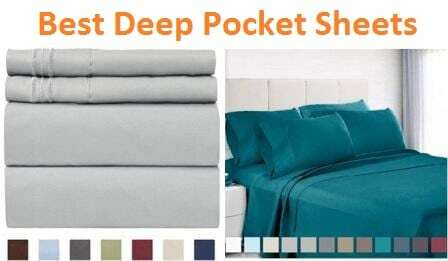 Talking of sleeping experience on these Danjor linens premium quality bed sheets, the crisp looking sheets feel really soft and give you a comfy nestle for a peaceful sleep experience. The microfiber in these sheets have a velvety feel and do not trap heat giving perfect ventilation for your body. Looking for something cozy to add some extra romance to your room décor? Todd Linens is here with a 6pcs bedding set designed in satin material. The bed gives a soft and silky experience to the user for a sound sleep. The 6pcs bedding sheet comes with a set of the duvet cover, 1 fitted sheet and 4 pillowcases that give your bed a perfect appearance. When it comes to the size and the fitting of the bedsheet and cases, it is well designed to suit both Queen size and King size beds with ease. The satin duvet comes with 220×230 cm while the fitted sheet is made with measures 152×203 cm. The cases come with dimensions 50×75 cm which is suitable for the big pillows of your bed. The bed sheets are available in a wide range of bright colors like black, navy, red, brown, purple, olive green, cream, and fuschia that give your bed an appealing look. Made out of fine satin and polyester, these luxurious bed sheets come with utmost softness with a silky feel. Light in weight, the sheet comes with an elastic fit on the right side that keeps it pretty high from the floor and wrinkles free on the bed. Love that soft bed with a breathable sheet? Todd Linens is well designed to give you the comfortable experience you are looking for. The material of the bed can be used in every season, that helps in regulating your body temperature for a sound sleep. Looking for a smooth and comfortable bed sheet to gift your mother? Try the exclusive range of bed sheets introduced by Satin Radiance. No matter whatever bed size you come up with, Radiance Charmeuse bed sheets are sure to add a luxurious look to your bedroom. Apart from a charming look, the bed sheets also provide you with a safe and sound sleep for a refreshing morning. Talking about the size and fitting of this marvelous range of bed sheets from Radiance, the bed sheets come in a 4pc set which includes a flat sheet, a fitted sheet, and 2 pillowcases. The size of the bed sheets is suitable for beds that include twin, twin XL, Full, Queen, King, and California King size beds. The generously sized bed sheets also provide you with lovely colors to select from like black, blue, blush pink, ivory, mocha, red, and silver. The fitted sheet is also given elastic that surrounds the sheet from every side that gives it a perfect look. With standardized quality, the bed sheets from Radiance Satin are made up with 100% polyester satin material. The imported material of the bed sheet with sheen beautiful colors is quite soft and silky which helps in adding to your sound sleep. Worried about breaking hair while you rest on the bed? No need to worry if you are using Radiance Charmeuse bed sheets. The bed sheet protects your hair from getting tangled and breaking. Again, the satin material helps in the maintenance of moisture balance in both the skin and hair promoting healthy sleep. If you are looking for a bed sheet that can give you the classic look and feel of shiny satin, this set from Natural Life is just what you need. This product is made from polyester material which helps lock the natural lustre in – wash it all you like but there is little probability that color will fade. The telltale sheen and slippery feel of satin are very much evident which is likely to result in your pillows slipping and sliding around a little. Anything else you put on the bedsheet is likely to experience a similar slip, but that’s the very least you can expect out of a satin product. This Natural Life satin sheet is available in queen size, twin size, full size, king size, as well as California king size. It makes a snug fit for a 17-inch mattress which is thick enough for providing good comfort and support on the bed. These satin sheets are very soft and smooth. They fit in nicely with the bed. Polyester material is machine-washable, so you can take good care of the product without the color getting faded even with repeated use. The sheets are a little thin and could tear upon the slightest of scratches. Polyester is not the most breathable of materials and will make you feel warm when you sleep. However, if you are okay with that, then the comfort of these smooth sheets is something you can really enjoy. Adjusting to the frictionless surface could take some time though. It does not matter how many times you wash them; the Chezmoi Collection bridal satin sheets will not let go off their color. That is what makes polyester such a wonderful product to work with – if dyed, the fabric tends to hold on for long. 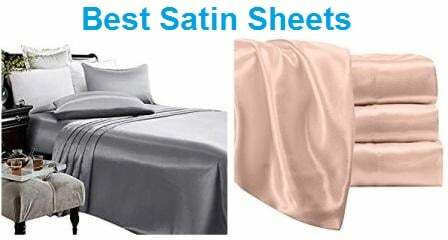 These sheets offer you the kind of soft, silky touch you would have come to expect from everything satin. While they are not exactly breathable, most users have spoken highly of the cool feeling it gives when touched. 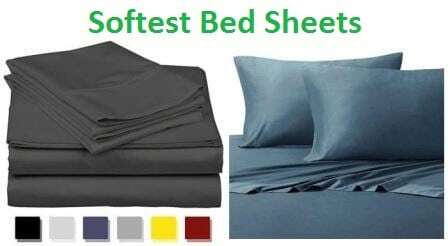 In keeping with the characteristics of satin, these sheets are slippery, but the all-around elastic allows a good fit. However, it is large enough to hold only 14-inch thick mattresses. This product is of a queen size though you can take your pick from full size, king size, and California king size as well. It comes with an elastic lining all around that helps to keep the sheet in place and gives a good fit with the mattress. This Chezmoi Collection bedsheet can fit mattresses of maximum 14-inch thickness which is not the most preferred choice for many. Like any other satin product, these bed sheets are of a very soft and comfortable feel. However, there have been numerous complaints about the poor thread count where people have had their toenails, fingernails, and rings getting snagged very easily, resulting in damage to the sheets. The sheets are soft and will help you enjoy a comfortable sleep. However, polyester does not breath and will make the bed warm, so if you are uncomfortable with that, these sheets would not be a good choice. The slippery nature makes it a struggle to remain in one place, something not many are in favor of. HollyHome has been in the business of linens and blankets for almost ten years and is known to produce quality products from quilts, duvet covers, comforters and, of course, bed sheets. They enjoy an excellent reputation for competitive pricing and quality levels. The four-piece luxury satin sheet collection includes luxurious and beautiful looking smooth satin sheets with two pillowcases. These sheets can make a lovely gift for family, friends, and wedding presents. Overall, a good purchase and value for money, and to confirm that the product has been reviewed in detail as below. The HollyHome satin sheets come with free fitted straps to help you fit the sheets and adjust the length as desired. These straps are very easy to fix and also keeps the sheet corners secured in place. The sheets are available in size Full, King, Queen, California King, along with queen size pillowcase. There is elastic all around the fitted sheet that can fit any mattress up to 17 inches deep. The HollyHome satin sheets are made up of 100% woven microfiber polyester satin which is smooth, comfy and has a silky soft touch. The density of the sheet set is 95 GSM. Get a classy finish look on your bed with these wrinkle resistance bed sheets. The sheets are available in eight different colors to suit all your decor needs. The satin sheets are sewn in three joints, woven tightly, and tailored well to guarantee you extra durability and strength. At times people don’t receive good sleep due to the sheets they sleep on. The reason could be many from being hot, itchy, and rough causing a restless night. One of the benefits of buying HollyHome satin sheets is that these microfiber sheets gives you optimal heat and feel smooth on your skin. These satin bedsheets from Bedsure may be made of polyester, but that does not mean they become less luxurious by any degree. Of a silky, smooth texture, you will get a cool feeling on touching them that will remind you of the kind of luxury afforded by five-star hotels. They also give you the sheen you would typically associate with any satin material. The fabric is resistant to numerous cycles of washing and drying. 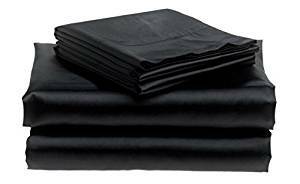 Customers have also said that they feel cool and comfortable when using these sheets in summer, unlike what you would expect from a satin sheet. 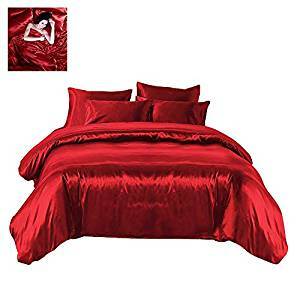 The color holds nicely because of the polyester make which is one of the biggest positives of buying a satin bedsheet. You can take your pick from twin, full, queen or king sizes for this bedsheet from Bedsure. This deep-pocket satin sheet has elastic running all around, allowing you to stretch it and fit it snugly on your mattress. It is recommended for a mattress of maximum 14-inch thickness. The superior comfort and cozy feel of this Bedsure satin sheet is something you will love. It is reminiscent of the kind of luxuriant treatment you can expect from a star hotel. However, you need to be a little careful with sharp objects and scratches which can damage the sheets. There have also been reports that repeated washes lead to a worn-out look of the fabric. This satin sheet has the slippery feel that is a common aspect for everything satin. While it makes it difficult to hold things in place, older people will enjoy the ease of turning on their side without much effort. The sheets reportedly make your bed a little warmer than usual, so you need to keep that in mind if you are uncomfortable about sleeping hot. 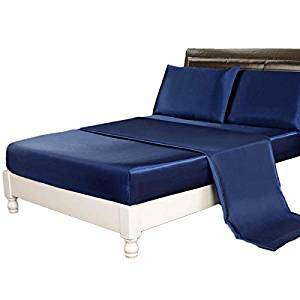 If you love the luxurious feel of a satin sheet and don’t want to see the texture fade away with repeated washes, this silky satin sheet from EliteHome is the thing you want. Featuring a soft and silky touch, this bedsheet will give you the comfort you had always dreamt of. The supple pink color looks very elegant and will remain even after repeated washes because the polyester fabric is good at keeping the colors in place. There is an elastic band that will allow you to stretch the sheet, so that fits in snug with your mattress. Many find the small size to be an issue as the sheet can fit only a 14-inch mattress. It is also prone to snag and could easily tear if scratched. This EliteHome satin sheet is available in king, queen, and California king sizes. The elastic band all around the product ensures you can stretch it for creating a tight-hug fit on your mattress. It is not a deep-pocket sheet and can accommodate only a maximum of a 14-inch thick mattress. Polyester material helps to keep the color in place even with repeated wash while the soft, silky texture is a delight to behold. The pink color also looks suave. There are some complaints about the build quality as it can snag easily and wear out against rough edges such as cracked heels. It can be machine-washed which makes these sheets easy to care for. These satin sheets sleep a little warm just like any other satin sheet. However, many have also said that they find it cool to touch and do not feel any discomfort while sleeping. It is a good choice for those who like turning over in sleep without much effort as the slippery feel makes it easy to do so. Divatex is one of the largest suppliers for home décor and fashion in North America. They offer a wide range of sheets, as well as pillowcases in polycotton, cotton, microfiber and other fabrics. Their products include duvets, top- of-the-bed products, decorative pillows, comforters, bed skirts, quilts, coverlets, blankets and throws. 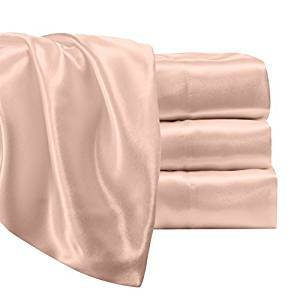 The Royal Opulence Divatex Home Fashions Satin Queen Sheet has a silky and smooth sheen made of polyester satin. The set has 1 fitted sheet, 1 flat sheet and 2 pillowcases. The fitted sheet has elastic all around with a 14-inch pocket for a mattress that can be 17 inches deep. It is easy to wash in the machine and can also be tumble dried. The gorgeous black color will add luxury to any bedroom, and the dark color means it is easier to manage stains. The Royal Opulence sheets can add a touch of elegance to your bedroom. The sheets fit well for a queen size bed, and the product is 16. 4 inches in length. The pillowcases are standard sized, and the fitted sheet has elastic around the edges to be secured over the bed. It has a 14-inch pocket and can accommodate a mattress that is 17 inches deep. 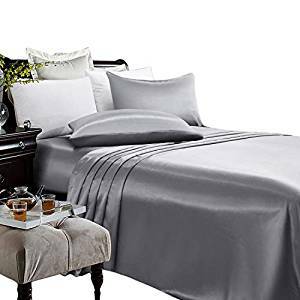 The Royal Opulence Divatex Home Fashions Satin Queen Sheet set is made of 100% polyester satin and has a smooth and lustrous silky sheen. The polyester is woven, ensuring that the sheet is strong. 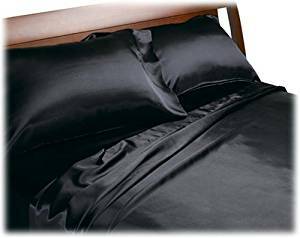 The Royal Opulence Divatex Home Fashions Satin Queen sheet has a smooth and silky feel. When you sleep on it, you will easily glide over the surface due to a lower level of friction. Wake up refreshed without lines on your skin with these sheets. The smooth and silky sheet that fits a queen bed perfectly. Comfortable and will not rip easily. Customers complained about the sheets snagging and ripping within a month. The set having the flat sheet and fitted sheet were in different colors. The fitted sheet didn’t accommodate the standard mattress very well. MK Collection offers a wide range of bedspreads, bed skirts, curtains, comforters and quilts. The Mk Collection 4-piece Soft Silky Satin Solid Color Deep Pocket Sheet set in grey and charcoal lends a feeling of opulence to your home. Get a good nights’ sleep on the smooth and soft sheets which do leave your skin and hair smooth and glossy. It is good for people with dust allergies as such sheets repel dust mites. The complete set has 4 pieces – 1 flat sheet, 1 fitted sheet, and 2 pillowcases. You can easily wash it using a washing machine and tumble dry the set. The MK Collection can be a comfortable and welcome addition to your room. 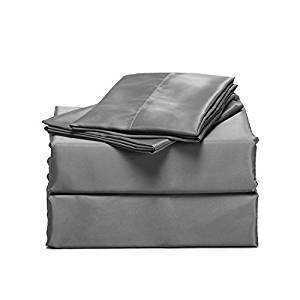 The Mk Collection Solid Color Deep Pocket Sheet set has a flat sheet that is 90×102 inches and a deep-pocketed fitted sheet that is around 60×80 inches. These sheets easily fit a queen size bed. The ends of the fitted sheet have elastic that attaches it to the bed. The sheets are made from polyester and polyester blend, the same material from which lingerie is made. The sheet will create a comfortable and smooth experience when you sleep at night on it. The smooth, silky feel of the sheet will allow you to glide on it. There will be no friction of your skin or hair against the sheet leading to glossy and healthy hair and skin. The sheets will be cool against the body in summer and warm up well in colder weather. No zippers on pillowcases to ensure that any size can be accommodated. Easy to care for by using a washing machine and the tumble dry technique. The sheets and pillow will prevent hair breakage and skin lines. There have been complaints of the fitted sheet splitting at the seams. The elastic band on the sheet appears to be loose. The stitching doesn’t seem to be up to the mark. Chezmoi offers comforter, quilts, coverlets and bed sets. The Chezmoi Collection satin sheet set is offered for a queen size bed in a gorgeous navy-blue color. The charmeuse satin bed sheets are made of high-quality materials that give you a smooth feel while lying on it. Perfect for any weather, these sheets offer a good nights’ sleep while protecting your hair and skin. The full set has 4 pieces that include a flat sheet, a fitted sheet with deep pockets and 2 pillowcases. There is an elastic band at the corners to secure it to the bed with ease. You can maintain this simply by washing it in the machine. The Chezmoi collection does add a look of luxury to your bedroom. The bed sheets all perfect for a queen size bed. The fitted sheet has deep pockets and elastic corners to be secured over the bed. The deep pockets are 16 inches deep.to fit most general size mattresses. The Chezmoi Collection of satin sheets is made of 100% polyester fabric which is easy to maintain. It has a thread count of 350, making it smooth and seamless. The soft, smooth material is strong and will not tangle with your hair. The elegant sheet is made of fine materials and has a smooth, silky feel. The smooth sheets will enhance your sleep and are perfect for all weather and seasons. Smooth satin and silky material that doesn’t feel scratchy. Easy to care for and gentle on the skin while sleeping. Complaints about a 12-inch-deep mattress not working for the fitted sheet. The color may bleed after a few washes. Weak elastic which may have to be replaced for it to be used. Artall supplies bed sheet sets, cosmetic organizers, bedding and furniture. The Artall Silky Super Soft Satin Sheet set is perfect for a queen size bed, although it does come for other bed sizes too. The grey colored bed sheets are made of high-quality materials that give you a smooth feel while lying on it. Perfect for any weather, these sheets give you a good nights’ sleep while protecting your hair and skin. The set has 4 pieces that include a flat sheet, a fitted sheet and two pillowcases. The sheets can be machine washed, set to gentle. These sheets can accommodate a mattress up to 17 inches deep, and the set comes in other colors like teal, blue, red, grey and golden. They are made out of polyester and make an excellent gift for family and friends. The bed sheets fit a queen size bed. The fitted sheet has deep pockets that are 14 inches in depth and has elastic corners to secure over the bed. The deep pockets can accommodate mattresses up to a depth of 17 inches. The Artall set is made of 100% polyester satin. The brushed microfiber material gives it a look of pure luxury and elegance. 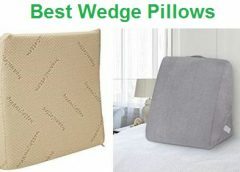 The material is soft and great for an uninterrupted night’s sleep. The elegant sheet is made of fine materials and has a soft, silky feel. The smooth sheets will enhance your sleep and are perfect for warm as well as cold weather conditions. Smooth, soft material to keep your skin and hair healthy. Best for summer months when the sheet will be a naturally cool surface. Some customers did not find the sheets as smooth as described. Customers complained that sheets ripped easily within the first month and were very thin.